I once had a boyfriend who was so desperate for pickles, he’d even drink a jar of pickle juice. I still haven’t quite forgiven him for scarfing down my expensive, hand-crafted practically Kobe-beef-fussiness-quality Japanese pickles that were carefully stowed away in my tiny apartment refrigerator in Tokyo. Bonzai, cried he, and shinkansened out of town before I could beat him with a keisaku. Thanks to his quick escape, we are still friends today, and I feed him pickles when I can. So this post is for him. It’s also for anyone who likes new dill pickles, the ones you get for free in New York delis, the half-sour ones. Sometimes called refrigerator pickles, mine are much better (she said, humbly) because they have the spirit of half-sours but take less than half the time of than regular refrigerator pickles. I developed the recipe while making real new dill pickles, a dubious wild fermentation preparation of whey, brine, and sitting on a counter for a couple days. (The Master Food Preserver in me says no, the mouth is saying let’s go.) When they work, they’re wonderful, slightly fermented, bright lime green, crisp, lovely. When they don’t, well, you could die of botulism. But the pickles I’m touting here are absolutely safe, and while not as good as real, fermented new dills, they are an excellent substitution and they only take a few hours to make. Having a BBQ this weekend? Try making these in the morning and serving them with your ribs in the evening. The pickles last about a day, but the quality starts to deteriorate after that, so plan accordingly. The preparation is inspired by Japanese cucumber salad, and also by my great-grandmother’s recipe for sweet and sour vinegar cucumber salad. In both of these salads, the cucumbers are sliced, salted, and left to sit in a seasoned vinegar and water solution. The Japanese sometimes add seaweed or sesame seeds; my great-grandma added thinly sliced white onion. I was making my regular new dill pickles, as I mentioned, and I ran out of the requisite whey before I ran out of anything else, so I was inspired to turn a long wait into something fresh and salad-like, but with dill flavor. I thought it might be an amenable idea to add pickling spices, garlic, and a couple heads of fresh dill to a brine and serve the cucumber “pickles” that night as a salad. And sure enough, it worked. Can you tell I’m super pleased by this one? I am. I have pickle addicts to feed. Wash pickling cucumbers well and slice. Make brine of water, salt and vinegar. 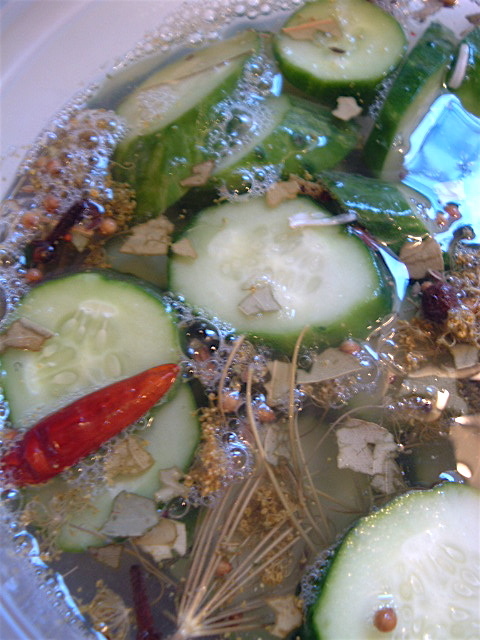 Mix well, then pour over cucumbers in bowl or plastic container for marinating. Add pickling spices, mustard seeds, garlic and dill. Cover container and refrigerate at least 4 and up to 12 hours. Does not keep for longer than a day or two. I think I’ll try small whole ones, then! I know that if you call a local farm stand, they can often make up a bag of beautiful bumpy little guys for you — even choosing which size you want. I got lucky at Lone Pine Farm (or unlucky, given that I was planning to do other things that day!) and they had huge bags of three sizes, S, M and L, for sale.